In newly updated paperback and e-book editions. 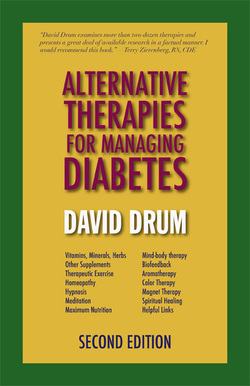 The new second edition paperback of Alternative Therapies for Managing Diabetes was released in January 2019. The 291-page print edition is 6 x 9, perfect bound, and priced at $14.95. a newly-updated e-book edition from Burning Books Press is priced at $5.95 includes live Internet links to professional and educational groups and support organizations and recently-updated information on alternative therapies. First edition cover by Bill Stanton/Stanton Design. Second edition cover by Arthur Kegerreis Design. First print edition and first e-book edition published by Contemporary Books/McGraw-Hill (c) David Drum 2002. E-book edition Burning Books Press (c) David Drum 2011. Second print and e-book edition (c) David Drum 2019. ISBN print edition # 978-0991185757. ISBN e-book edition # 978-0-9845646-6-8.